Budapest in 1900 was a flourishing metropolis of artists, writers, and political thinkers. Their exquisite architecture, a fascinating mix of Neo-Gothic, neo-Renaissance, Art Nouveau and Oriental elements, created Budapest’s beautiful and unique look. While these artistic wonders were neglected during the later half of the century, they are now being successfully renovated. 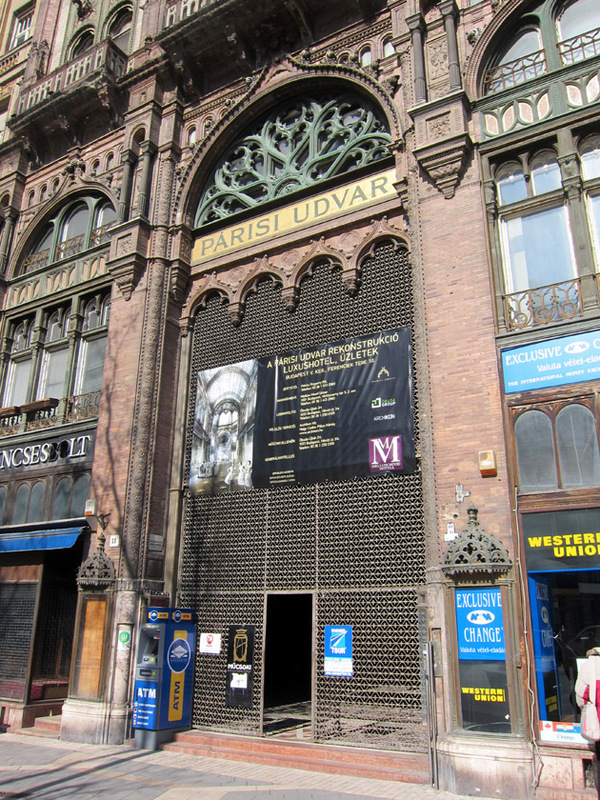 The Parisi Udvar (or Párizsi Udvar in modern Hungarian) has so far escaped restoration and is an evocative treasure from the past. 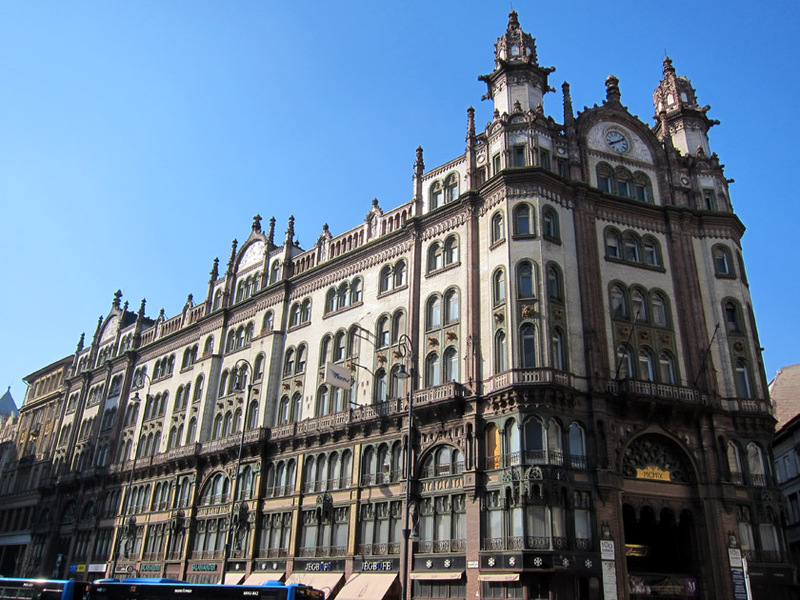 From the outside, the Brudern-ház building is one of several elegant late 19th century buildings surrounding the Elizabeth Bridge in Pest. Inside however is a massive, covered indoor shopping gallery arranged in a long “L” shape. The building was designed by Henrik Schmahl, a student of Budapest’s greatest architect Miklós Ybl, and fits seamlessly into an oddly shaped city plot. The building was completed in 1913 and originally housed shops and offices. Following World War II, the upper floors were converted into apartments. The tenants and shops began leaving the building in the 1970’s and 1980’s because the structure wasn’t being kept up. Today where there are only a couple stores remaining in the exterior, street facing commercial spaces. 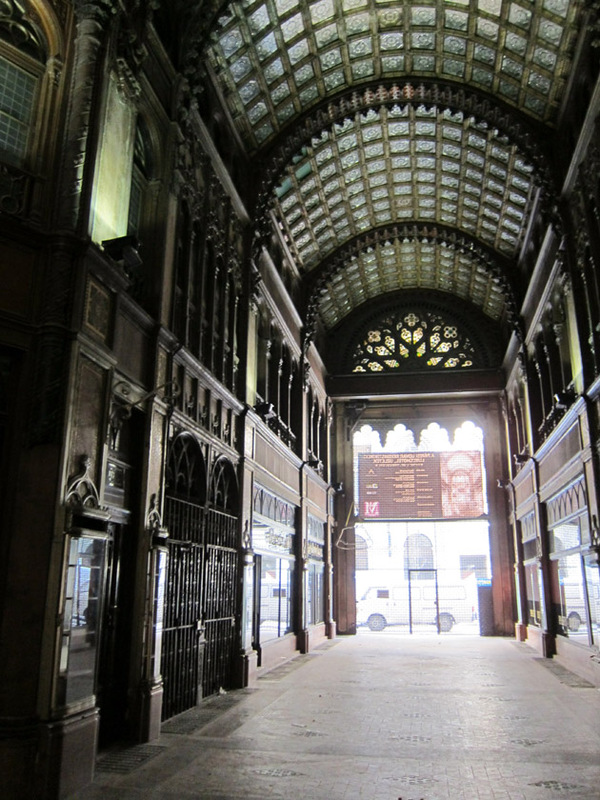 While the exterior of the building is lovely but muted, the covered shopping gallery inside is beautifully decorated with a mix of Neo-Gothic and Moorish elements. There is a glass and metal dome shortly after you enter at the “L”-bend, and then a much larger full glass dome halfway down the long hallway. 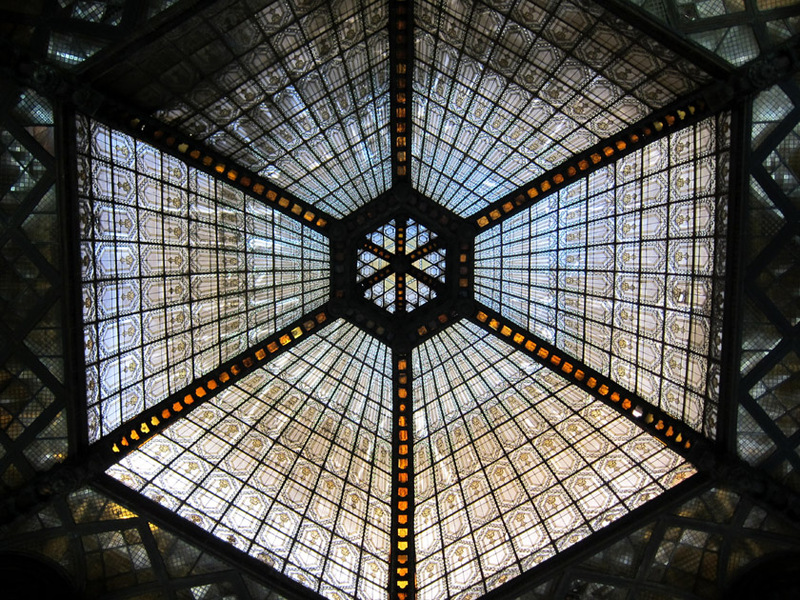 The incredible glass and metal ceiling just inside the doorway. View down the long corridor. Part of the glass dome is visible halfway down. At the far end, the small dome area is drenched in sunlight. The enclosed boulevard is eerily quiet and dimly lit by sky lights and a couple spotlights. I ran into a local office worker smoking and texting under the glass dome who quickly left after seeing me, but otherwise it was completely empty mid-day. 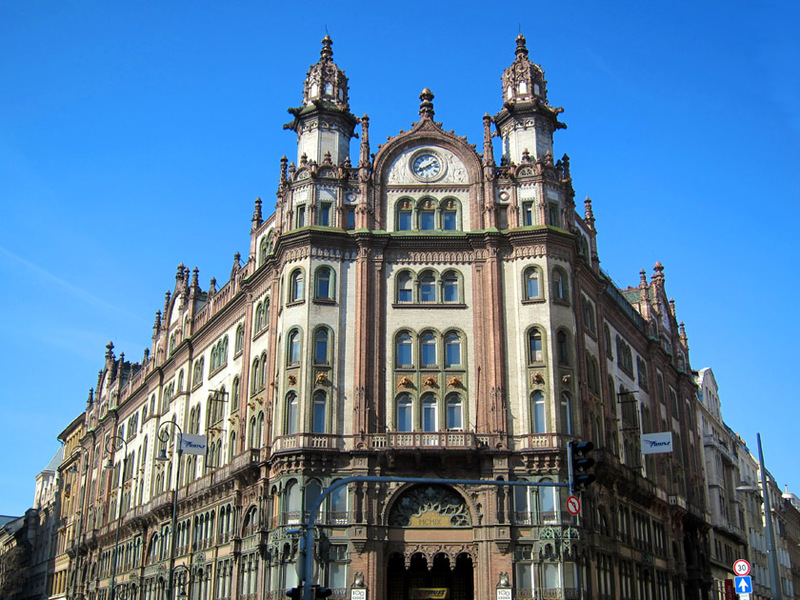 The building deafens all the busy street noise along Lajos Kossuth street outside. You can hear your own footsteps on the tiled floor echoing off the massive vaults. An empty display case and an empty shop with peeling wall paint. Under glass dome, looking toward the closed street entrance. All things considered, I thought the interior was in good shape. 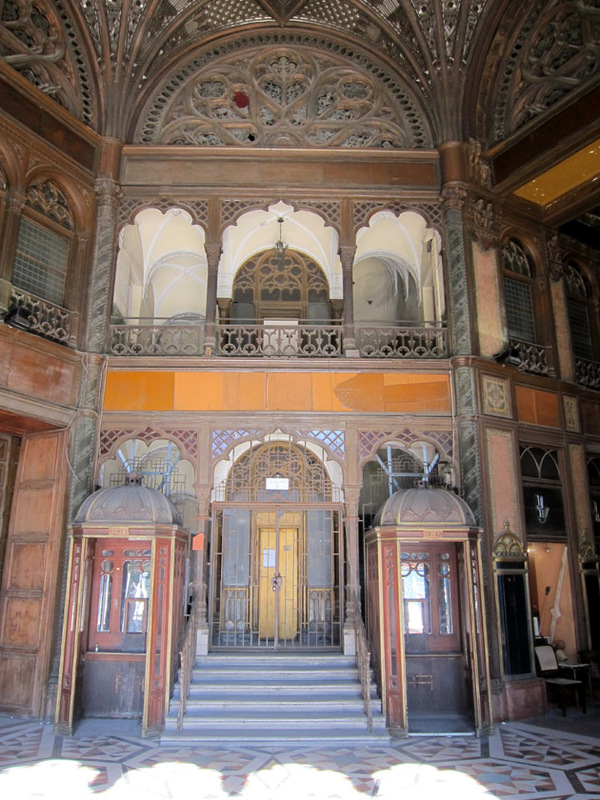 Although they were covered with a layer of ancient grime, you could still see the red marble, brown wood, yellow tile, green mosaic, and gold painted elements. The neo-Gothic tracery along the upper windows still seemed intact The pressed metal decorative columns were only a little dinged up. Some of the ceiling glass seemed yellowed, but maybe they just needed to be washed? What appears to be an old phone booth under the metal and glass dome. 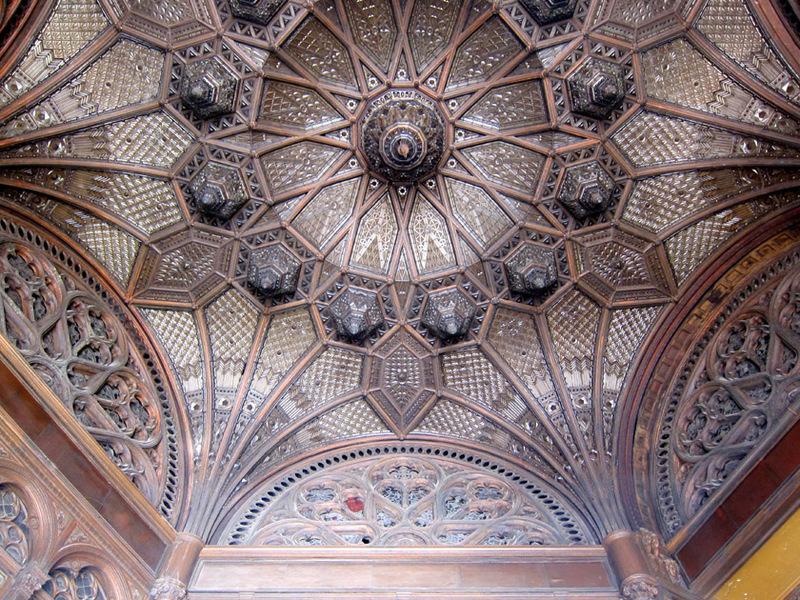 The entrance to the Párizsi Udvar is not at all obvious. As you can see below, you enter through a small open door in a large gate located a few meters from the entrance to the Ferenciek tere metro station. If I hadn’t stopped to check my map, then I might have missed that there was an odd door into a hidden, cavernous architectural space. Inconspicuous street entrance into Párizsi Udvar. While wandering the shopping boulevard, I kept thinking, “Someone needs to take care of this place. Someone should restore this.” As you can see (maybe) in the picture above, the black banner states that the property has been recently purchased by a developer and is going to be converted into a luxury hotel with high-end shops. 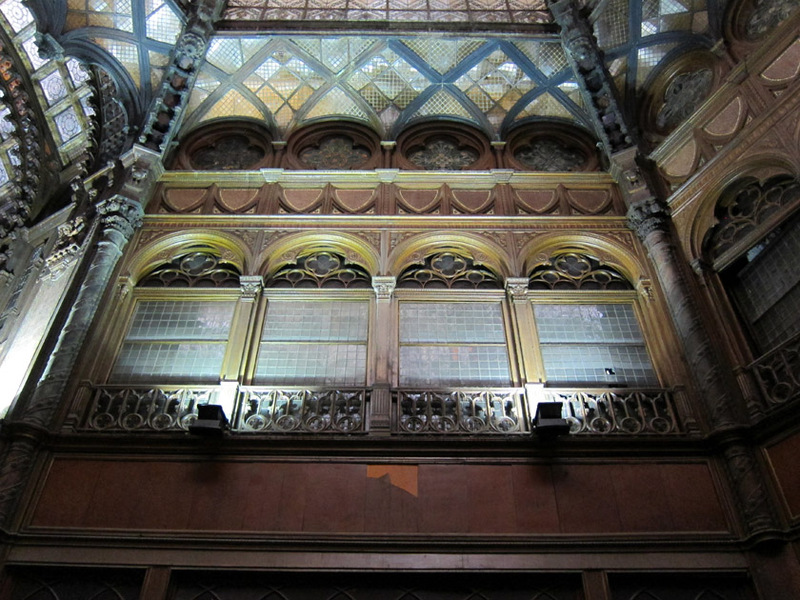 Budapest is rich with restored architectural beauties. (Really, really rich as I’ll show you soon.) 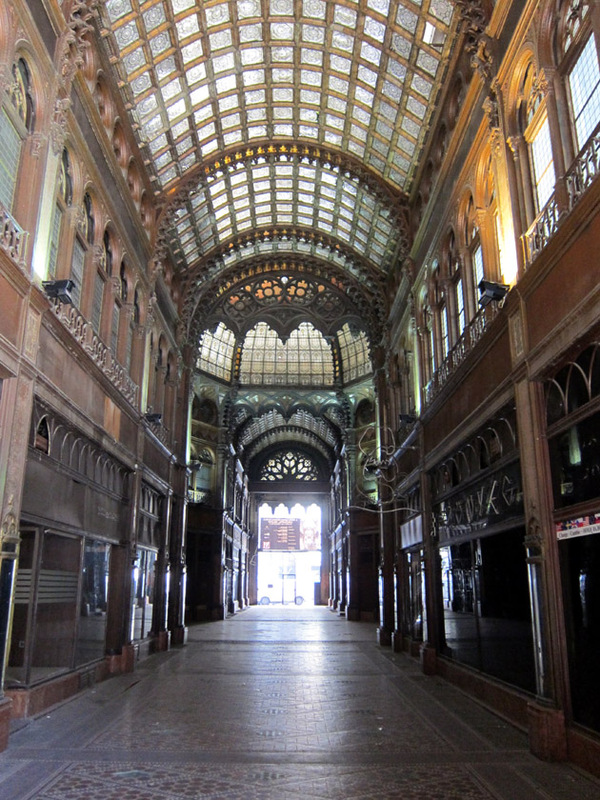 But Budapest doesn’t have many architectural ghost anymore. While I’m happy the Párizsi Udvar is getting the care it deserves, I will miss that thrilling moment when I stumbled into a magnificent, lost place with dusty decorations and patched up glass windows. I can only hope it retains that magic in its future renovated state. But just to be safe and to get the full effect of discovering something spectacular, you better go see the Párizsi Udvar now. 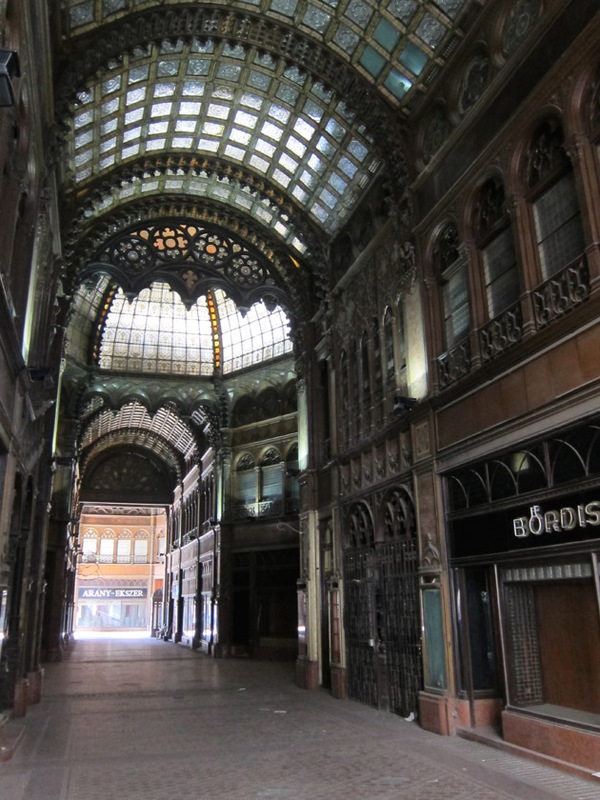 I can well imagine a film or music video shoot taking place in Parisi Udvar shopping arcade. Oh absolutely, Hungary is gorgeous! I can definitely understand more and more movies being filmed there. The Andrassy Street is Budapest has been used for several movies as a stand in for Paris and Munich because it has such beautiful mansions and looks elegantly continental. I was so happy to find that the door to Parisi Udvar was open! What an amazing find! 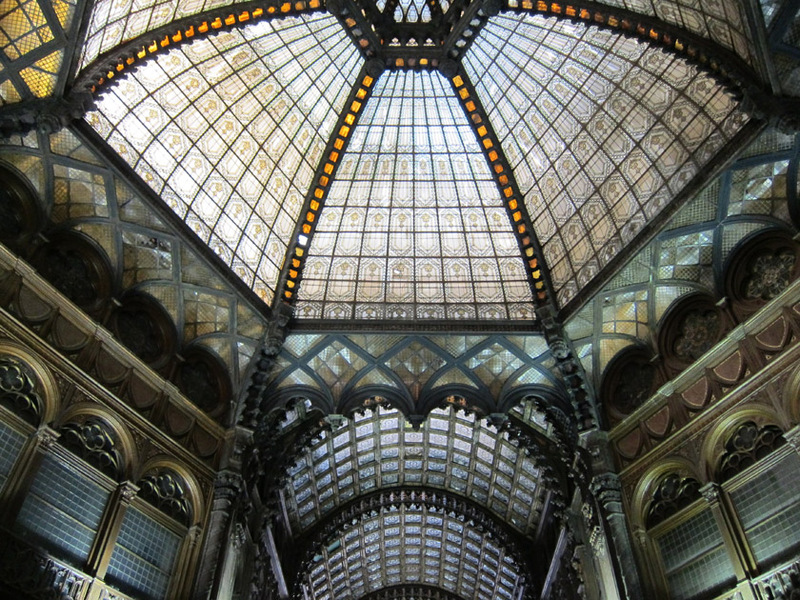 I have been wishing to tour more of central/Eastern Europe while these places still exist. I guess economic depression/recession has been the champion of preservation! Hope to see more soon! I’ve been traveling around the Mediterranean mostly which was part of why I wanted to visit Hungary. It’s definitely beautiful and worth exploring soon! Parisi Udvar was actually an exception. While the last five years have been tough on all of Europe, many buildings have been renovated since Hungary’s entry into the EU and more are in the process of being renovated. There will be plenty of great things to see; it’s the ruins that are disappearing! 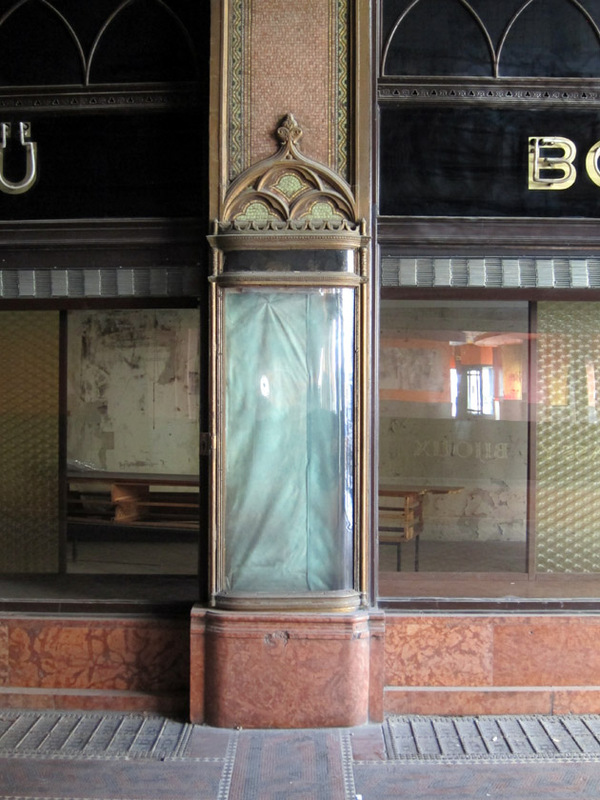 Even Budapest’s famous “ruin pubs” are being embraced by hipsters and cleaned up. We have mostly been around the Adriatic, although I did see he Mediterranean on my last trip… My husband’s Italian family extends down into what is now Croatia. There is a mix of history and culture that I love, but I am craving more! Crossing fingers for 2016 – have to save up after last year. Budapest is definitely on my list! 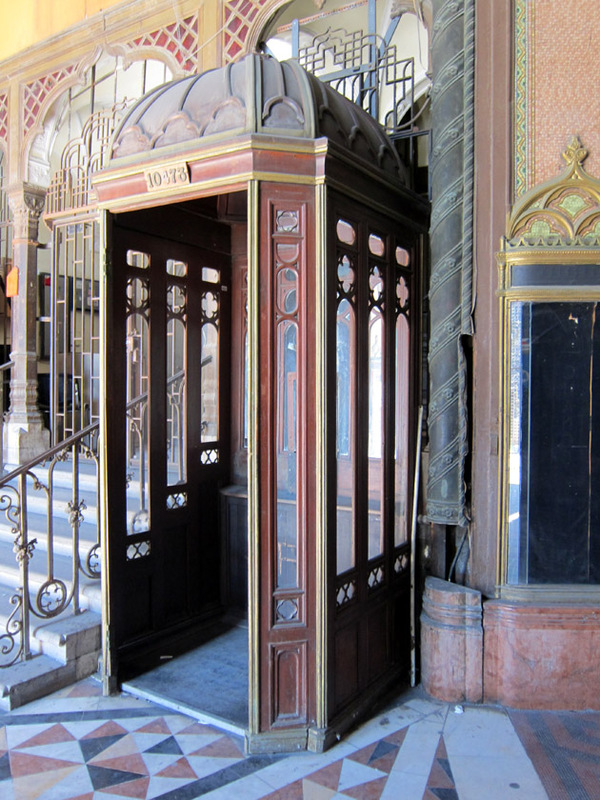 What an incredible find – I’m sure I would have gasped upon entry! 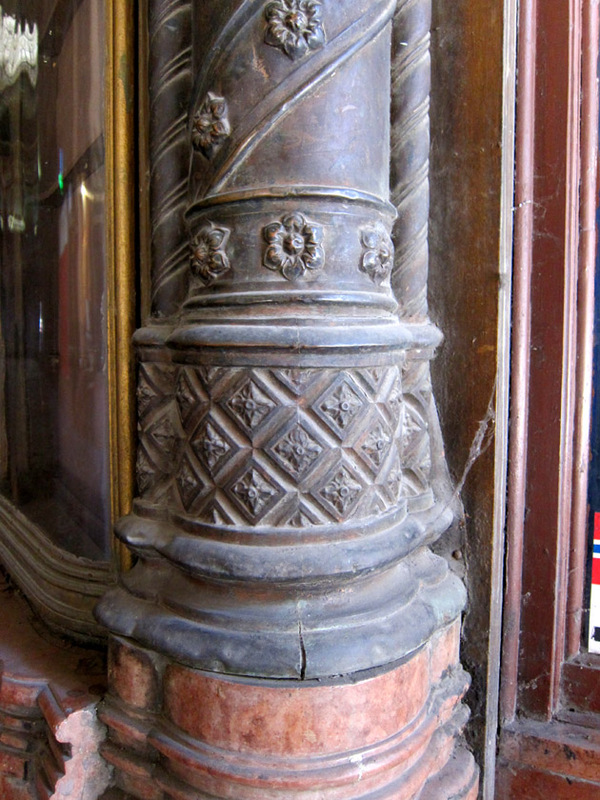 I sure hope the developers keep all those splendid old details! I’m impressed they aren’t covered with graffiti. I know, isn’t it gorgeous! The developers have a lot to work with. I found very little graffiti in Budapest, so I think that’s why it hasn’t been tagged. Yes the Parisi Udvar is exactly the way you stated. Please fix it up but I love going through this almost abandoned building and seeing “ghosts”. It is a gem not seen on tourist brochures and that makes it so much more special.